1 x NEW FRONT ABS SENSOR. TO FIT P11 ALL MODELS AS LISTED BELOW. 1.6i , DOHC, Estate, W11, Eng:GA16DE, 1597cc, 16v, 4Cyl, 99bhp. 1.6i , DOHC, Saloon, Hatchback, P11, Eng:GA16DE, 1597cc, 16v, 4Cyl, 99bhp. 1.6i , DOHC, Hatchback, Saloon, P11E, Eng:QG16DE, 1597cc, 16v, 4Cyl, 104bhp. 1.8i , DOHC, Saloon, Hatchback, Estate, P11E, WP11E, Eng:QG18DE, 1769cc, 16v, 4Cyl, 112bhp. 2.0i , DOHC, Estate, W11, Eng:SR20DEL, 1998cc, 16v, 4Cyl, 128bhp. 2.0i , DOHC, Saloon, Hatchback, P11, Eng:SR20DEL, 1998cc, 16v, 4Cyl, 128bhp. 2.0i , DOHC, Saloon, Hatchback, P11, Eng:SR20DEH, 1998cc, 16v, 4Cyl, 148bhp. 2.0D , SOHC, Hatchback, Saloon, P11E, Eng:CD20T, 1974cc, 8v, 4Cyl, 90bhp. 2.0D , SOHC, Estate, WP11E, Eng:CD20T, 1974cc, 8v, 4Cyl, 90bhp. FULL RANGE OF DISC KITS AVAILABLE FOR ALL MODELS. 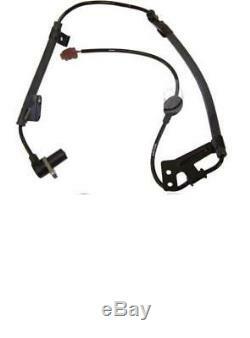 The item "FOR NISSAN PRIMERA P11 1996-02 FRONT ABS SENSOR NEW" is in sale since Friday, February 08, 2008.